Yesterday at night the wind reached 35 knots. It made such a loud and horrible noise that I felt myself as if being in the middle of military airport at the beginning of war. The wind sang hellish songs and sent damns to all who hid in shelter in time. So did we. We had returned to St.Pietro, and the bay, where we stayed the previous time, should had safe us from fierce north-west wind. There were 10 other yachts, who found the shelter for that night there. The “address” of the hospitable bay: 39°06.0270N, 008°18.2403E. This place is interesting not only because of the good anchorage, another reason to stop there – further in this post. 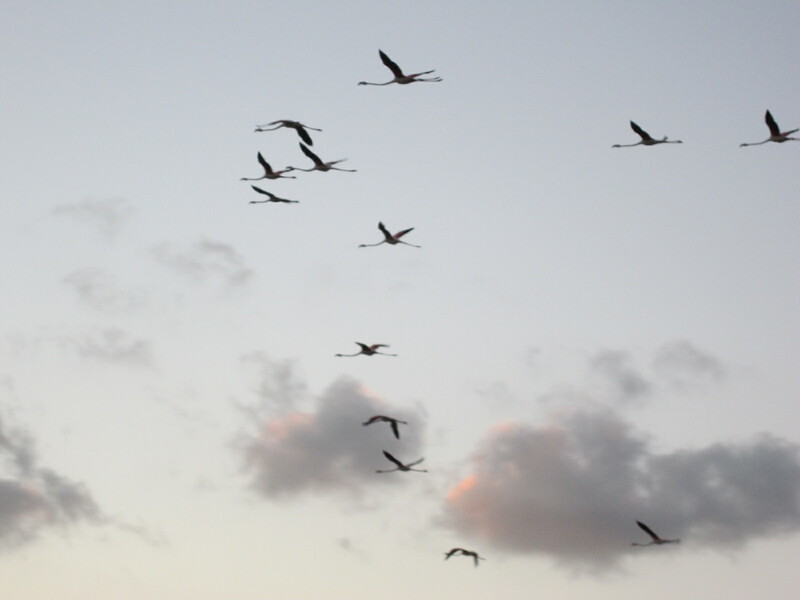 The map of St.Pietro that we have on board is ornated with pictures of pink birds – flamingos. 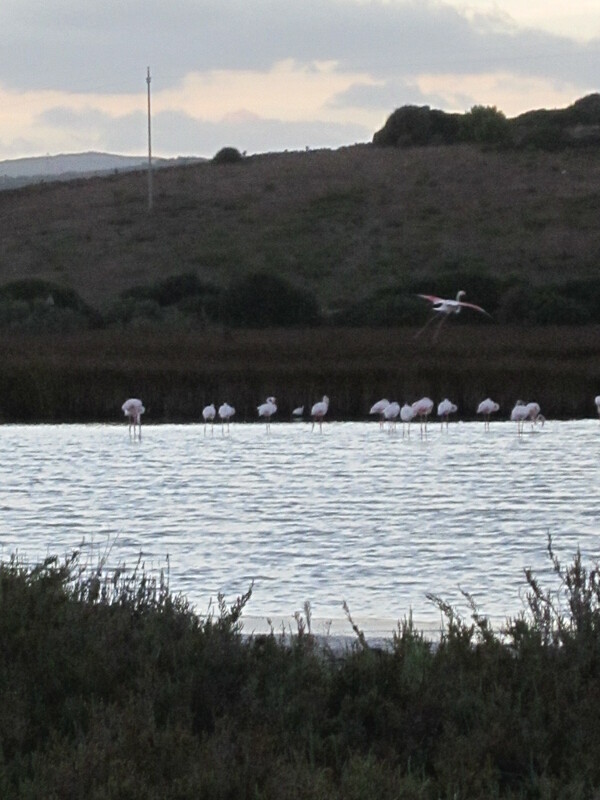 In the middle of the town there’s a lagoon, where these birds are often seen. When we stayed in the town, I watched for them for two days – and saw no one. “Probably, they are seasonal”, – was my suggestion. Isabel was leaving “Vagabong” on 9th of August. 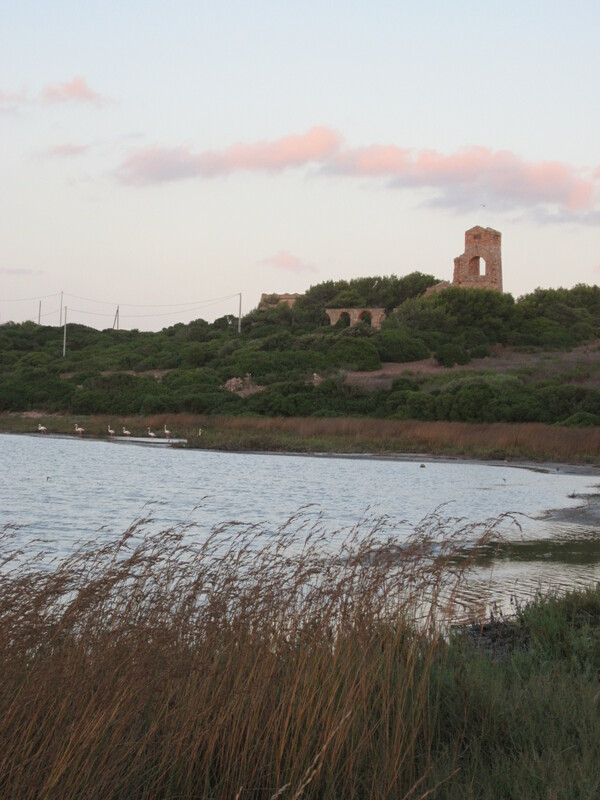 When she went to the town to discover the way to Sardinian airport, she found a couple of attractions, very close to our bay: ruins of an old church and a lake with… flamingos! On Tuesday I got a mission to see them. Ruins of the church near "flamingo" lake. I was lucky to find an English-Italian speaking guy, who helped me in communication with locals. With some difficulties we defined the spot. 1 km down the road – and it’s in front of me: half lake, half swamp. I recognised my “dream” birds from a distance: their light-coloured feather reflected the light of the sun, setting down, and were shining. There were many of them – probably, a hundred, maybe, more. Birds look graceful, when they feed, bowing their long necks to the water, or walk in shallow water. But when they reach a deeper place, they start to look very clumsy and funny, lifting high their thin legs. Their voice is quite grumpy, and they sound like a crowd of old angry ladies. They heard me and hurried to escape to another part of the lake. I took my shoes off to be more quiet, but it didn’t help. They know well that humans are not those creatures that deserve trust.